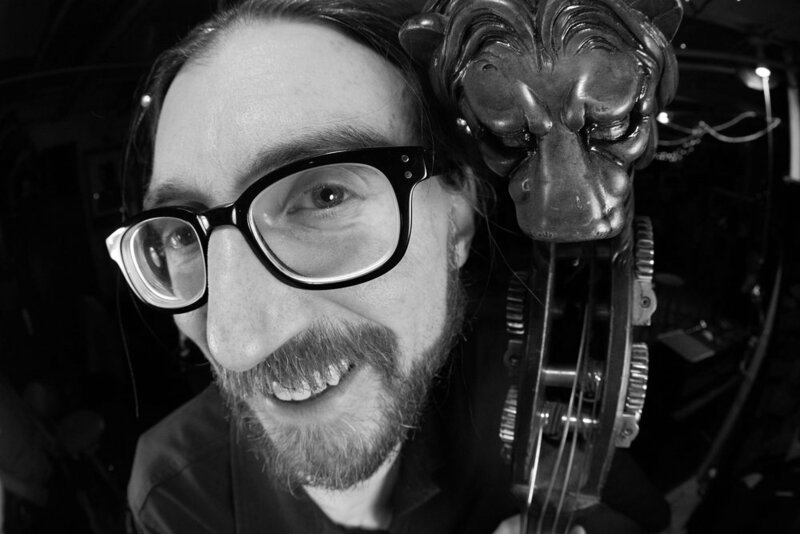 On Wednesday, April 3rd, free improvisational bassist, Gahlord Dewald joined us on Rocket Shop for some live music unlike we’ve ever had on the radio show before. He bowed away at his double bass, experimenting with different pitches and patterns, and even used the wood of the instrument for percussion. Free improvisation is is not to be confused with other branches of improvisation, such as jazz improvisation or “jam bands”. While there surely is music made up on the spot in these genres of music, there is underlying rhythm, key and tonality, whereas free improvisation has no structure. There is no set starting point, and the ending is unknown. Gahlord painted a picture for us, stating that for other forms of improvisation, the musicians do not take any unexpected turns, and it’s like “walking down the street,” while free improvisation is like “walking down the street while someone else is off swimming in the lake.” Although Gahlord performed a solo act for us, he mentioned that he prefers to plays with others. He said that it’s like having two toy mobiles hanging in the same room. They are doing different things and going different directions, yet they still have a relationship. Gahlord explained that each genre of music celebrates something different, and that free improv celebrates “the fact that we’re individuals in this world at this time... and isn’t that crazy?” Gahlord described free improv as “exploring what’s available to us for expressions as humans, exploring the physics of sound.” Free improvisation forces us to ask us what sound is, and why we organize it in certain ways. At a concert, does the show start when the janitor comes on stage to sweep, or does it start when the musicians strum their first chord? This is the type of question that free improvisation raises. By playing free improv in a public setting, Gahlord hopes to create a space for people to self-reflect and exist, instead of worrying about “clicking next.” Currently, Gahlord is working on a project called Community of Sound, a space just upstairs from Big Heavy World that produces experimental music and is “dedicated to the pursuit of sound.” Right now, the organization is running a co-sign series, bringing in other experimental musicians such as Elizabeth A. Baker, who is coming in to give a workshop on Music in Technology from April 13-17. Hearing free improvisation music live is an interesting, self-reflective engagement, best-experienced with eyes closed and mind opened. For opportunities to hear Gahlord and other local musicians live, sign up for his email list at gahlorddewald.com!